Our primary product is the Acme Suzuki Samurai Turbo Diesel Adapter, though we manufacture anodized aerospace driveshaft spacers that are made for your Samurai and are Suzuki proven. "Got Zuk!" stickers look nice anywhere on your Suzuki. Place them on your bumper, fender, or over a dent. 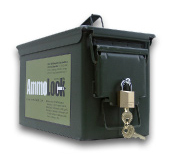 Take a look at the clever AmmoLock products. If you snorkle around water in your Suzuki, you'll like AmmoLock's lockable water proof storage boxes. You can place them just about anywhere in or on your Suzuki; under your hood, inside the cab, on bumpers. Great for keeping wallets and other valuables dry and secure while off-roading. ACME Drive Shaft Spacers Got-Zuk! Stickers for fun! "I got the kit today via FEDEX. I am extremely impressed with the kit. Not only the heft and beef of the materials, but the welds are excellent as well (Much better than the welds that I have seen on some of the different manufacturer's lift kits). Also, thanks for the hat-that thing rocks!"